Nail guns are one of the most crucial air tools for any home-based projects. Nail guns offer many uses from light wood making projects to household construction work. However, finding a suitable air compressor that can handle different types of nail guns isn’t simple. That said, each type of nail guns will require differently; therefore it’s daunting to choose the most suitable one, especially when there are so many air compressors on the market to select. Don’t worry! In this article, I will help you lift the burden by introducing six best air compressors for nail guns below. You also find relevant information regarding the types of nail guns and the pressure with which they are compatible. 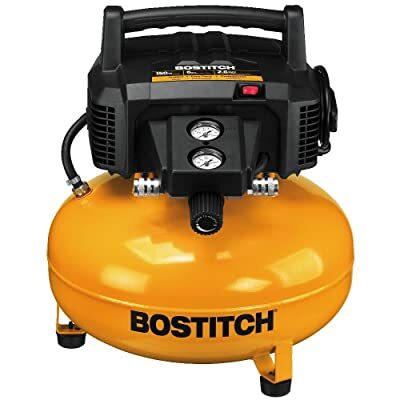 If you have spent quite a lot of money on your nail guns, and want to look for a budget-friendly air compressor, the Bostitch BTFP02012 6 Gallon is what you should pick. It’s safe to say that this piece of machine offers the best price while delivers its excellent performance. When it comes to handling nail guns, the Bostitch BTFP02012 features necessary specifications for it to maximize the operation. Most nail guns will ask for maximum 120 PSI and the air volume of 2 CFM at 90 PSI to work. The Bostitch BTFP02012 can produce up to 150 PSI of air pressure and deliver 2.6 CFM at 90 PSI. That will allow you to drive nails at reasonable acceleration. Bostitch has recommended using the BTFP02012 with finishing and flooring nailers. This 6-gallon pancake air compressor is exceptionally portable, weighs only 29 lbs. You can easily drag it around when the work requires. What’s more, the motor work perfectly under different weather conditions. It uses an oil-free pump, requiring less maintenance. What seems to be the drawback is the fact that you have to wait quite some time for the machine to accumulate pressure. Plus, this model is quite noisy during operation even though it has an acceptable noise level of 78.5 dBA. The Bostitch BTFP02012 is undoubtedly a product of value for anyone who wants a bit of good-quality machine without paying a fortune for it. Plus, you can save even more money if buying a whole kit including the Bostitch BTFP02012 and nail guns. California Air Tools 5510SE is another excellent air compressor for nail guns I want to mention in this list. When it comes to portability, this model is also very transportable thanks to its built-in wheels and convenient grip. As for the performance, this is a 5.5-gallon tank, which is excellent for an extended working cycle. The good news is this machine only requires less than 1 minute to fill the tank. It can create up to 120 PSI of air pressure. And at 90 PSI, the maximum air volume it can yield is 2.20 cubic feet per minute. The specifications do not allow the California Air Tools 5510SE to work with heavy-duty pneumatic tools; however, it surely can handle one nail gun at a time. One more plus, the California Air Tools 5510SE offers an oil-free pump, you don’t have to worry too much about the maintenance while dealing with this type of pump. Compared to the Bostitch BTFP02012, this model is quite hefty. The motor is also not quite robust to handle different nail guns at the same time. The California Air Tools 5510SE is an excellent choice for home-use. It is a great and affordable piece of air compressor for light operations. I think it’s safe to say that DEWALT D55146 is the best of the best oil-free air compressors on the market. Just simply looking at the specifications, you will agree with me. The DEWALT D55146 can produce a maximum 225 PSI of air pressure, which is nearly double compared to other available air compressors. So DEWALT can deliver 80% air than the majority, allowing you to work longer. Plus, this model also has a short recovery period, around 22 seconds, so you don’t have to wait for too long for the next operation. The DEWALT D55146 yields 5.0 SCFM of air volume at 90 PSI. This means the machine can handle at least 2 or 3 framing nail guns at the same time. It functions well in harsh working conditions and works correctly with heavy-duty pneumatic tools. Many framing carpenters prefer DEWALT for their jobs. DEWALT features highly effective motor and durable pump. They both boost the machine’s performance while extending permanency. The adjustable handle increases the portability. Plus, this product features a supporting stand, so that you can let it stand vertically or horizontally as you wish. The only drawback of this product is the price. With this price, you can buy two different air compressors from other brands. However, if you qualify the excellence and performance, the DEWALT is the must-buy item. All in all, the DEWALT D55146 is a great piece for heavy-duty operations. If you want to find a high-performance air compressor that can handle more than one nail gun at the same time, this should be your go-to product. As for oil-lubricated compressors, I only entrust Makita. Their line of products is, hands out, the best ones in the market for reliability, durability, and versatility. Makita’s Big Bore series is solid-built with powerful motors, big pump, so that you can work without worrying too much about the refill. What’s more, the robust motor runs smoothly, create less noise than other oil-free air compressors. Though Makita products aren’t cheap at all, they are worth every single penny. 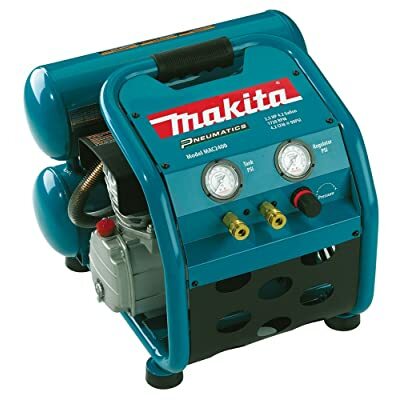 Makita must be one of the prominent manufacturers who are famous for reliable, high-quality air compressors. Their line of products is compatible with both light uses at home or heavy duty operations. In this list, the Makita MAC700 Big Bore is the one that is suitable for homeowners thanks to its features and specifications. 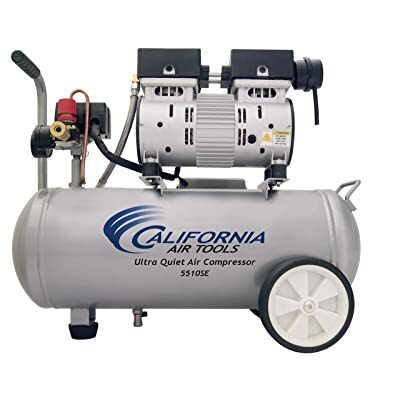 This air compressor can produce maximum 130 PSI of air pressure. At 90 PSI, it creates 3.3 CFM of air volume. This makes the Makita MAC700 Big Bore suitable for handling nail guns. If you don’t use too many guns at the same time, Makita will undoubtedly perform as expected. Makita adopts the 2.0 HP motor, which allows the MAC700 to draw and compress a large volume of air. As a result, it enhances the overall performance and shortens the recovery time. Many home-based users favor this model because it is not as loud as its counterparts while offering exceptional durability and top-notch performance. At the same time, lots of professionals also trust this model since it can handle most types of nail guns from roofing to framing ones. The Makita MAC700 Big Bore isn’t flawless of course. The design of Makita makes it look a bit bulky, and I have the feeling that it is heftier than the manufacturer’s weight. Overall, The Makita MAC700 Big Bore brings more bang for the buck for both DIY hobbyists and professionals. Though it can’t handle different guns at the same time, it indeed can handle many types of nail guns. Certain nail guns require more than standard air pressure and air volume to keep it up and running. If you are handling something like that, the Makita MAC2400 will be a great companion. Personally, I think it’s hard to find reasons not to choose this piece of machine. It offers a high-quality iron pump, which is oil-lubricated. This ensures the durability and overall performance. Plus, the piston is designed to accelerate recovery time, allowing you to use nail guns longer without frequent interruption. The Makita MAC2400 can produce maximum air pressure of 130 PSI and deliver 4.2 CFM of air volume at 90 PSI. Typically, a framing nail gun will require at least 2 CFM of air volume to run correctly. Looking at the specifications of Makita MAC2400, you will notice that the machine enables you to run 2 nail guns at the same time. I particularly like the design of Makita MAC2400. It features the cage-like structure that is suitable for protection from external factors. Plus, the powerful motor allows this piece to enlarge the air volume within the short period and provide utmost efficiency. What don’t I like about this model? Probably it is the price tag. 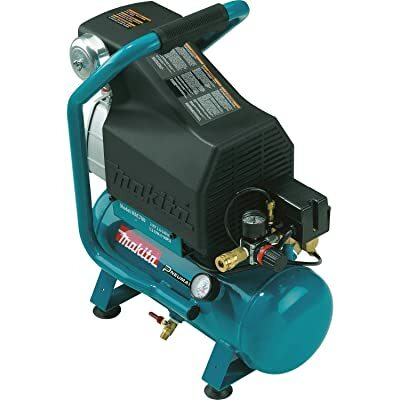 I know that the quality and performance of Makita MAC2400 is worth the price, but still, those want to save up a bit would have to think twice when purchasing this air compressor. The Makita MAC2400 is indeed worth every single penny you pay for it. If you want to find a powerful motor to handle heavy-duty nail guns, this model will surely do a great job. Makita’s line of products has always satisfied users for its versatility and durability. The last item I want to review, the Makita MAC5200 Big Bore is the one that can handle demanding pneumatic tools at the same time. This product indeed has the industrial capacity. It offers a wheel kit for ultimate transportability in any garages or workshops. On the downside, it is quite heavy. 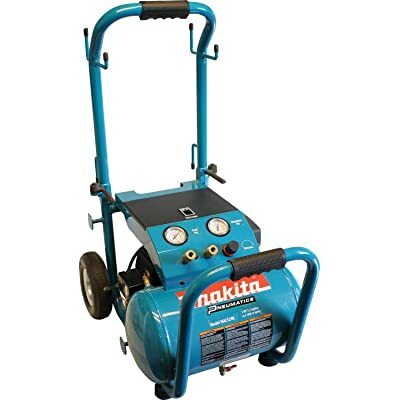 The Makita MAC5200 features a 5.2-gallon tank. When it comes to the ability to handle heavy-duty pneumatic tools, the size of the air tank is an important matter. When you want to use air tools to tighten bolts or frame walls, the big air tank will allow you to work without much interruption. As for the ability to work with nail guns, the Makita MAC5200 can yield 6.5 CFM of air volume at 90 PSI of air pressure. It also can produce 140 PSI of maximum pressure. This allows the machine to handle 2 to multiple air guns at the same time. The cutting-edge pump from Makita can work more effectively while producing less heat than other models on the same line of production. The oil-lubricated pump, though requires more attention, often lasts longer. One thing that I am not satisfied with this model is the weight. I think it is slightly heavier than the actual weight. The Makita MAC5200 can guarantee both stable performance, versatility and durability. Those who want a heavy-duty air compressor that can handle different pneumatic tools at the same time shouldn’t ignore this product. Nail guns are divided into two categories: battery and air powered. Generally, most heavy-duty nail guns are air powered because they require more power than batteries can provide. In the market, you will find 5 popular types of nail guns. Framing nailers are heavy-duty air tools that are used for massive woodwork, and other construction projects. The nails are generally 2½” – 3½” of length and come with a head of different shapes. Framing nailers offer industrial power for long working cycle projects with wood such as creating the house’s frames. Roofing nailers feature short nails and big heads so that you can adjust the depth of the shots when working with shingle. This type of nailers also offers coils used for carrying. Roofing nailers are perfect for nailing roofs and even asphalt shingles. Finishing nailers utilize 14 to 16 gauge with at least 1 to 2½” nails length. This type of air tools is famous for its flexibility when it comes to different kinds of household projects such as trim, molding, and short-working cycle woodwork. Nowadays, many manufacturers offer finish nailers powered by lithium-ion batteries. This is great, especially if you only use nailers for short-term use. Brad nailers are light-duty air tools. They offer 18-gauge nails with ½” to 2 nail lengths. These tools work perfectly well with different wood making projects, wide-ranging domestic repairs, and even some trim work. Pin nailers are favorite air tools of DIY mechanics, especially those who are interested in small wood making projects. These types of nail guns often come with a head using 22 or 23 gauge nails. Some models don’t feature heads. What size air compressor do you need for a nail gun? To answer this question, you need first to determine the type of nail guns you have and how long you want to operate it. A standard portable air compressor which can generate at least 2 CFM of air volume at 90 PSI and a maximum air pressure of 120 PSI would be enough for a big nail gun to deliver roughly 15 drives in a minute. A medium nailer can deliver up to 30 nail drive in a minute, while a small one could run at 70 drives in the same amount of time. If you only work with medium and small nail guns and want to run them simultaneously, all you need is a compressor that can generate 4.0 CFM air volume at 90 PSI. Heavy duty guns will require a larger CFM rating to operate. In case you only want to use one at a time, a CFM of 2.0 is enough. How much pressure do you need for a nail gun? Different types of nail guns will require different pressure to operate. Most framing nail guns with 3- to 3 1/2-inch nails will only cooperate with air compressors that can generate from 100 to 130 PSI. Finish nail guns, on the other hand, can work well with the air pressure of 60 PSI to 120 PSI. Roofing nailers can operate at a range of 90 PSI to 100 PSI. When using this type of nail guns, you need to pay attention to the pressure since it can affect the depth of nail drives and the roof’s strength and lastingness. So now you have all the decisions in your hands. Remember when choosing an air compressor, you need to put the type of nail guns and the length of each working cycle into consideration as well. If you only work with light-duty nail guns, I suggest you go for the oil-free air compressors. They are typically budget-friendly and work perfectly well with one to two nail tools. In case you operate on heavy-duty nail guns, the second category – the Makita oil-lubricated air compressors will make the best options. I hope that you would find your most suitable product after reading my listicle of the best air compressors for nail guns.